People’s Kitchen | Abandon Spoon! 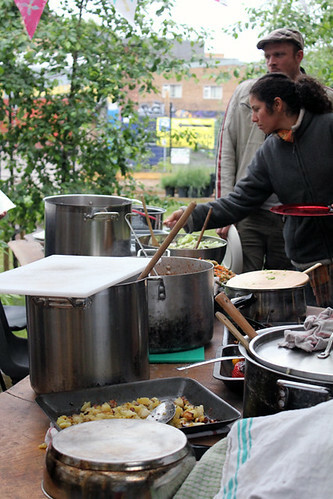 Run every Sunday a handful of people go around collecting surplice food from around the community and bring it back to Passing Clouds in Hackney to make a feast. 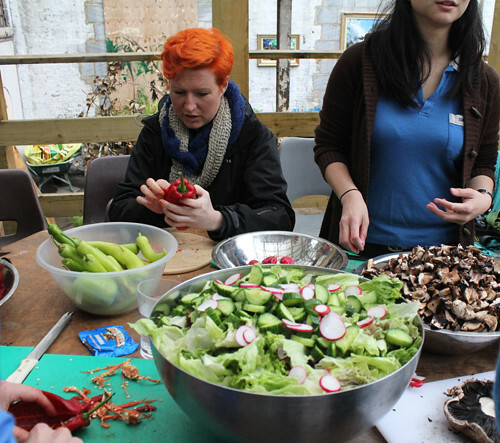 From about 3pm onwards a collection of volunteers sort through the food and come up with some delicious dishes. Then at about 6:30pm the food is ready and is eaten. 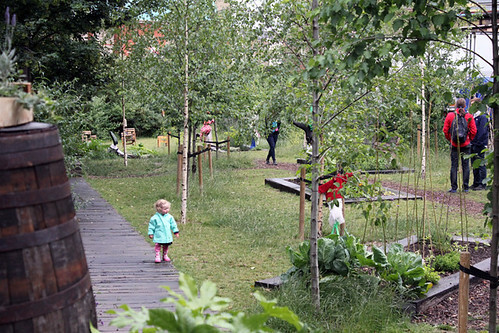 The day that I joined they had set up camp in the Dalston Eastern Curve Garden- a community garden built on a piece of wasteland. 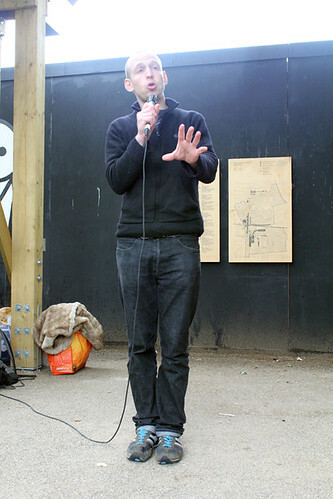 They also had a couple of other events on at the same time- a poetry reading from Angry Sam and a rollapalooza and group bicycle ride. 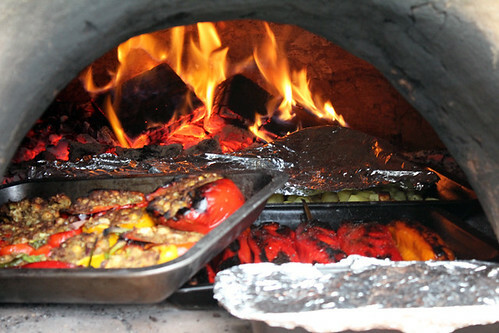 It was quite a cold day to be outdoors and by the end of the afternoon I found myself huddling up to the oven. But even despite the cold weather I really enjoyed myself. 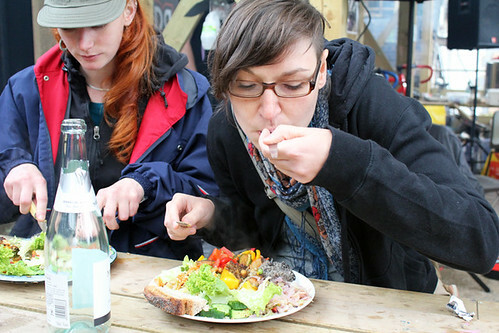 It felt really good to go and meet new people, get stuck in with the cooking- creating dishes out of whatever ingredients we could find, and then seeing everyone enjoying our creations. Gave me a really good feeling- quite a motherly feeling really. I almost wasn’t even that bothered about eating the food after it was cooked I was just so proud of what we all had achieved. There was a varied selection of people of all ages, nationalities and backgrounds all pitching in together and there was a really nice community atmosphere. 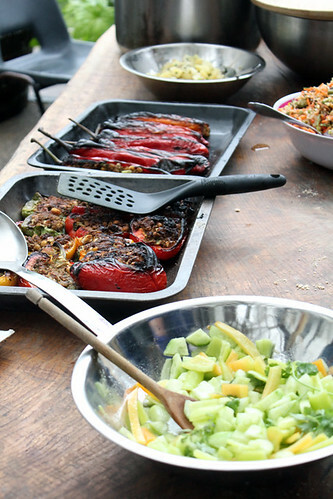 All the food dishes we prepared were vegetarian and some were even vegan dishes. I have been meaning to go again, but have been away most weekends so unable to make it. I love the idea of not wasting food as we are all guilty of this to some degree, and its great that local businesses gave produce that they couldn’t sell on as often companies are too worried about getting sued to do this.